In cultivated tomato hybrids (Marglobe × Mo938), the anthocyanin-free gene shows linked inheritance with the d (dwarf) gene on chromosome 2, but with a recombination frequency approximately three times higher than that according to the genetic map and in other hybrids with the Marglobe line. Cytological analysis of the mother pollen cells of the hybrids (Marglobe × Mo938) revealed no abnormalities of meiotic division and segregation of chromosomes, as well as no decrease in fertility. 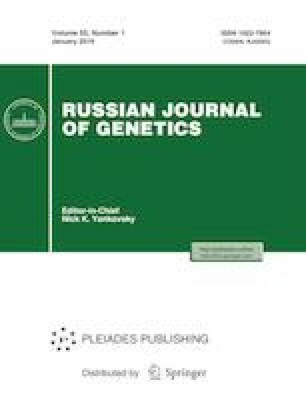 By means of the functional allelism test, it was established that, unlike Mo500, Mo504, and Mo755 marker tomato lines, in Mo938 the anthocyanin-free trait is not determined by the aw (anthocyanin without) or aa (anthocyanin absent) genes of chromosome 2. Using the F2 progeny of interspecies hybrids (Mo938 × Solanum pimpinellifolium), independent inheritance of the anthocyanin-free gene relative to the wv (white virescent) and d marker genes, as well as to six SSR anchor markers distributed at different sites of chromosome 2, was established. Thus, the Mo938 tomato line carries the d and wv markers on chromosome 2, as well as the anthocyanin-free gene not belonging to chromosome 2.